To ensure freshness, orders are shipped on Mondays and Tuesdays only. Orders placed after 2pm on Tuesdays will ship the following Monday. Enjoy immediately or store frozen until ready to enjoy. These are not your average burger buns. These Bavarian pretzel burger buns makes every burger or sandwich a delicious gourmet taste experience. With our unique art of Bavarian baking and imported Bavarian ingredients, prepare your taste buds to savor the lightest and fluffiest bun anywhere outside of Bavaria! 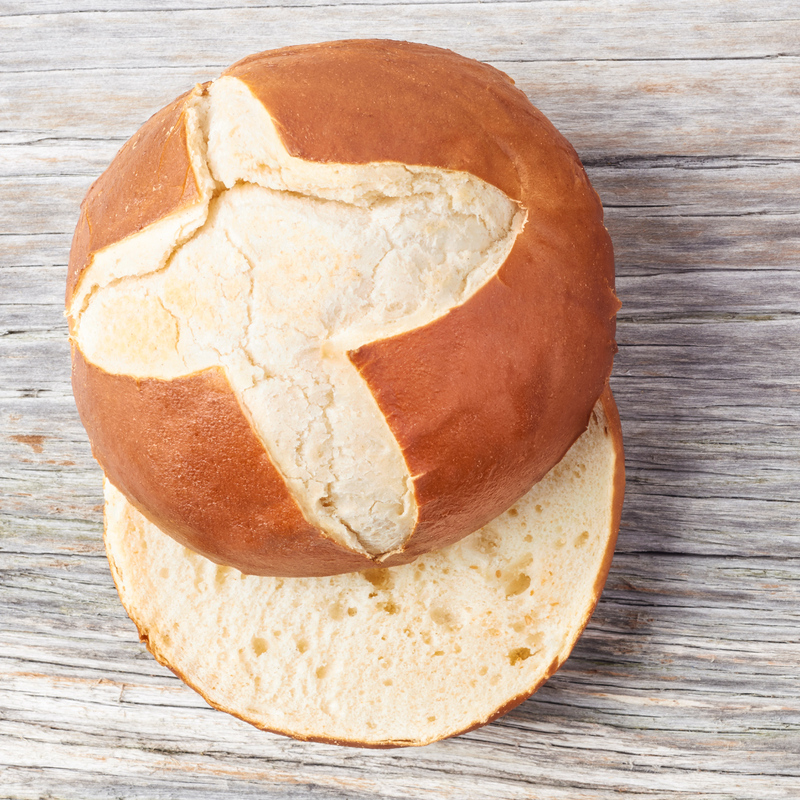 You’ll take your American burgers and sandwiches to new heights with our Bavarian pretzel burger buns. PROST! Pretzel Buns are fully baked. No additional baking required. We carefully pack these gourmet buns individually so you can enjoy their full goodness one piece at a time. When you’re ready, please remove from packaging and thaw the burger buns at room temperature for at least 15-30min. on the outside and fluffy on the inside. For a quick preparation, just pop the 2 halves in a toaster on “light” setting. You can do a “crisp check” pressing your finger on the crust, and the burger bun skin should crack a little bit. Don’t hurt the bun! Now you’ll be able to enjoy the authentic Bavarian crispiness with the fluffy, airy inside that makes our burger buns so darn delicious. Enjoy! It’s our mission to make you, our customer, happy every single day. We truly love what we do and you can taste it in every savory morsel of our pretzel twists, breads, and desserts. That smile on your face at first bite, yup, it’s why we do what we do, and it’s why we’re so darn happy. We know you’ll love our gourmet pretzel buns and we’d love to hear from you. We invite you to visit our site and look for us on social media. the day they arrive, please store them in the freezer until you are ready to enjoy (take them out of the freezer, as needed). STORE FROZEN at all times. Store at 5 – 8° F / -15 to -20° C.
Store at 5 – 8° F/ -15 to -20° C. Do not defrost (thaw) and refreeze. Do not reheat. Stored in the freezer, they have a shelf life of 6 months. Ambient: use the same day. Ingredients: Wheat Flour, Water, Whole Egg, Yeast, Palm Oil. Contains 2% or Less of: Ascorbic Acid, Canola Oil, Cultured Wheat Starch, Dextrose, Enzymes, Lactose, Malted Barley Flour, Maltodextrin, Milk Protein Concentrate, Natural Flavor, Nonfat Dry Milk, Rice Flour, Salt, Sodium Hydroxide, Soybean Oil, Wheat Gluten, Whey Solids. Processed in a facility that uses egg, milk, soy, wheat.